How well you care for your mouth can have a significant impact on your overall health. Dental hygienists across the United States want you to understand the importance of good oral hygiene and how it can help keep you healthy. October is National Dental Hygiene Month, a time when hygienists ramp up their efforts to highlight the importance of oral hygiene. Oral or dental infections can trigger sepsis. Such infections could be just below the gums, in a tooth, or even the tongue, palate, or cheek. Not all infections can be prevented, but you can lower your risk by taking care of your teeth and mouth, and having regular cleanings and check-ups with a dental hygienist and dentist. Dental hygienists generally focus on preventative oral care. 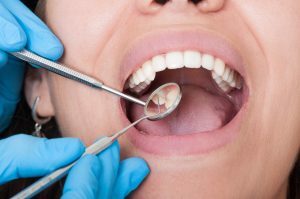 A typical appointment may include a thorough cleaning of your teeth, an examination of your mouth for signs of gum disease, x-rays of your teeth, and a discussion about your mouth and improvements, if any, to make in your oral care routine at home. Not only can good hygiene and regular cleanings reduce the risk of developing cavities, they reduce the risk of developing infections. Infections in your mouth can spread and lead to severe complications such as endocarditis, inflammation of your heart’s inner lining, as well as sepsis. If you suspect you have an infection in your mouth or tooth, call your dentist’s office or clinic immediately. Treatment with antibiotics may be necessary. Rinsing your mouth with salt water while you wait for your appointment may help relieve some of the symptoms. You and your hygienist are a team, working together to maintain good oral and dental health. Aside from visiting your hygienist regularly, be sure to brush your teeth thoroughly at least twice a day, but don’t over brush. Overly enthusiastic brushing can damage your teeth and irritate your gums. Floss regularly and don’t use your teeth for anything other than chewing – no opening packages! This can chip or break your teeth. Infections can also occur after you have had a dental cleaning or dental work, so if you have any signs of an infection after a dental appointment, contact the office or clinic right away. Taking care of your mouth and your oral hygiene can have a significant impact on your overall health. Speak with your dental hygienist to learn more. Read some Faces of Sepsis stories about people who developed sepsis from a dental infection.